In Part 2 of our discussion on “The Healthy Properties of Spices” we will look at identifying healthy spices, learning to cook with them, and how to build and maintain your personal spice cabinet. Healthy spices are one of the fastest ways to take a meal from bland to mouthwatering. Knowing what spices to use in cooking can be like sailing off into uncharted waters. The unknown flavors, the effects on food, the appropriate quantities and how to utilize healthy spices can be intimidating. Many recipes contain a list of spices to help you navigate through unknown territories. One study shows that 93% of recipes, containing at least 4 ingredients, included a minimum of one spice. The good news is that once you get accustomed to the flavor or intensity of a spice, even the most casual cook can experiment by adding a “dash of this” or a “pinch that” into their meals. Knowing when to add healthy spices is an important consideration when cooking for nutrition and flavor. Let’s make the distinction again between spices which are concentrated and dried and those that are aromatic, edible herbs which are generally from the leaf of the plant and used fresh (and sometimes dried). To release the flavors and properties of healthy spices, it is generally better to add spices at the beginning of the cooking process to allow the heat and moisture to release the essential oils in the spices. Edible herbs are best added at the end of the cooking cycle. Flavors from some healthy spices may intensify greatly during the cooking process. Erring on the side of caution, and adding more spice as you go may be a wise and palatable decision. In addition to learning about the healing qualities of healthy spices, it’s important for the cook to be able to identify spices and their flavors. Being spice educated allows a cook to easily incorporate healthy spices into a meal. Beyond common spices, such as pepper, cinnamon or vanilla, do you really know what a spice tastes like, or how it blends with other spices or foods? When you eat at a restaurant, can you name the spices that are being used in your meal? Being able to identify a spice in a dish is talent that some discerning palates may have, but if you don’t know what the origins of the flavors are the easiest thing to do is ask! By paying attention to the “detail” of the chef’s creation you will be complimenting the cook. When preparing a recipe yourself, take the time to “taste test”. Learning how a spice affects a food will make you more confident when preparing other dishes. You’ll also determine what flavors you like “more or less” of. Spicing a meal to your liking, or to your family’s liking, will enable you take a recipe and put your signature on it! Healthy spices are flavorful and even add color to food. However, when we rush through a meal, we don’t take the time to experience the full sensations of the healthy spices or of the other ingredients in our meal. Textures, smells, colors, flavor intensity are all parts of a meal that we can experience from a sensory perspective. One of the best pieces of nutritional advice is to take time to dine. Dr. Sears’ “Rule of 2’s” recommends that we take twice as long to chew our food. The overall goal here is to take more time to enjoy our meal which will help us digest and assimilate the nourishing and healing properties of our food. Walk down the aisles of a common supermarket and you’ll be sure to find a “spice section”. Common spices are readily available for purchase as well as a few not-so-common spices. 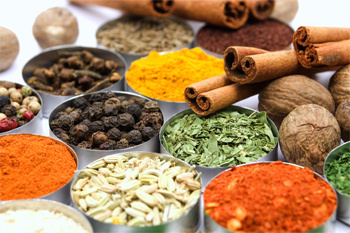 To really search out new or exotic spices, a trip to a local ethnic store could become a spicy adventure. Spices are available on-line as well, but to be sure to do your homework. As we mentioned in Part I of our spice exploration, spices were often used as forms of payment or treasured gifts. Some spices today can still hold “high value” and are a bit expensive to purchase. Experimenting with spices can be a costly venture if not done correctly. Price shop and take into consideration quality and quantity. Health and life are both a journey. Christopher Columbus originally set sail in search of spices. Along his adventure he also found new lands, interesting people and new cultures. Adopting the adventurous spirit of an explorer, we can also view our own personal spice exploration as an opportunity to discover new flavors and foods from new lands and cultures. Along our wellness journey, we can find new ways to nourish our bodies and promote health through healthy spices. View Part 1 of this series for a background on spices and their healing properties. Part 3 of this article explores the synergy of spice blends and preparing your own spices for flavor and health.